Earning an online health information technology degree can lead to many exciting career opportunities. In fact, the Bureau of Labor Statistics (BLS) projects that 27,800 new jobs will be added over the next decade in response to the influx of aging Americans and use of electronic health records. According to PayScale, entry‐level health information managers earn $42,000 annually. After 5–10 years of experience, this figure climbs to $48,000. Pursuing a health information technology associate degree online qualifies you for this lucrative field with the potential for professional advancement over time. What Will I Learn in an Online Associate in Health Information Technology Program? Hutchinson Community College ranks #1 on The 25 Best Online Associate in Health Information Technology Degree Programs! Shoreline Community College ranks #2 on The 25 Best Online Associate in Health Information Technology Degree Programs! Peirce College ranks #3 on The 25 Best Online Associate in Health Information Technology Degree Programs! Dakota State University ranks #4 on The 25 Best Online Associate in Health Information Technology Degree Programs! Students looking to pursue a health information technology associate degree online may be interested in Dakota State University’s AS in health information technology. This program prepares learners to work as health information technicians, teaching them the skills needed to ensure the accuracy of medical records and protect patient health. Courses available to distance learners pursuing their AS include fundamentals of disease and diagnosis coding, revenue cycle management, and healthcare data analytics. All students in the health information technology program also complete a supervised professional internship, which provides networking opportunities and hands-on training at a healthcare facility. Distance learners qualify for a variety of scholarships and grants at DSU, including several reserved for individuals studying health information technology. Applicants need to meet one of the following requirements to qualify for admission into DSU’s associate programs: earn an ACT score of at least 18 or an SAT score of at least 870; hold a cumulative 2.6 GPA or higher; complete the GED with a minimum total score of 580 (or at least 145 on each subject); or graduate in the top 60% of their high school class. Dakota State University is regionally accredited by the Higher Learning Commission (HLC). DSU’s associate in health information technology program is fully accredited by the Commission on Accreditation of Health Informatics and Information Management Education (CAHIIM). Collin County Community College District ranks #5 on The 25 Best Online Associate in Health Information Technology Degree Programs! Founded in 1985, Collin College predominantly serves residents in Rockwall and Collin counties in the area northeast of Dallas, Texas. The school also has an online health information technology degree, which appeals to distance learners who want to improve healthcare outcomes by effectively managing healthcare data. Graduates of this program go on to work in positions throughout the healthcare field, including at hospitals, government agencies, insurance companies, home care providers, and long-term care facilities. All coursework for this associate of applied science in health information management is available online. The 60-credit degree features classes in quality assessment and performance improvement, coding and reimbursement methodologies, and medical records technology. Students must also complete a professional clinical experience at a healthcare facility in Texas. Additionally, participants may elect to earn Collin’s certificate in medical coding and billing; this 30-credit certificate is also available online. Admission into the program requires applicants to place at the college-level for all of Collin’s assessments in reading, mathematics, and writing. Applicants must also hold a minimum 2.5 GPA, complete prerequisite coursework related to biology and health information technology, and pass the Test of Essential Academic Skills. Students should submit an essay explaining their interest in the field and two reference letters. Collin College is regionally accredited by Southern Association of Colleges and Schools Commission on Colleges (SACSCOC). The health information management degree program is fully accredited by the Commission on Accreditation for Health Informatics and Information Management Education (CAHIIM). Gateway Community and Technical College ranks #6 on The 25 Best Online Associate in Health Information Technology Degree Programs! Gateway Community and Technical College, located in Florence, Kentucky, offers a health information technology associate degree that hosts 50% of its classes online and the other half in person. On-campus evening courses take place at Gateway’s Edgewood campus. Gateway is the only public, accredited two-year institution in Northern Kentucky, and distance learners can access online technical support, tutoring, and digital library services. This 60-credit program requires students to complete courses in clinical classification systems, healthcare management and statistics, and pharmacology for health information professionals. In their last semester, learners also complete a four-credit clinical practicum. The program typically takes five semesters to finish. Before enrolling in any health information technology classes, students must complete a prerequisite digital literacy class. Graduates of the program can sit for AHIMA’s RHIT exam. Career options for individuals who hold an AAS in health information technology include patient information coordinator, insurance claims analyst, health data analyst, medical billing specialist, clinical coding specialist, and medical records technician. Gateway Community and Technical College is regionally accredited by the Commission on Colleges of the Southern Association of Colleges and Schools. The AAS in health information technology program is fully accredited by the Commission on Accreditation for Health Informatics and Information Management Education (CAHIIM). Fisher College ranks #7 on The 25 Best Online Associate in Health Information Technology Degree Programs! Founded in 1903 as a business school, Boston’s Fisher College offers a variety of practical, career-focused degrees. The school’s online health information technology degree combines healthcare and new technologies, focusing on legal issues in health information, management of filing systems, and storage of health data. Students learn all about health data, including its organization, evaluation, analysis, computation, and coding, while also receiving training in health information technology software applications. Distance learners enrolled in the associate program can transfer in up to 34 credits towards the degree. Learners typically graduate in six semesters. This 71-credit program requires learners to complete coursework in coding systems and classification systems, healthcare reimbursement methodologies, and the law and ethics of healthcare. Students also take two supervised professional experience internships — one in the first term and one in the last term. These three-credit internships allow students to gain hands-on experience in a healthcare organization, while also providing valuable networking opportunities. At the end of the program, graduates can take AHIMA’s RHIT exam. To prepare for this, program participants can take an RHIT preparation course offered by Fisher. Alumni have found work as health information services operations managers, claim trust analysts, clinical coding specialists, and health information privacy officers. Fisher College is regionally accredited by the Middle States Commission on Higher Education (MSCHE). The AS in health information technology program is fully accredited by the Commission on Accreditation for Health Informatics and Information Management Education (CAHIIM). SUNY College of Technology at Alfred ranks #8 on The 25 Best Online Associate in Health Information Technology Degree Programs! One of eight colleges of technology in the State University of New York (SUNY) system, SUNY College of Technology at Alfred offers a health information technology degree online. The school’s AAS in health information technology prepares students to assume leadership and management roles in the health information industry. The program covers data analysis, maintenance, and collection and provides an understanding of the regulatory, legal, and medical requirements of healthcare. Applicants to the program must have completed courses in high school keyboarding and biology. Distance learners complete a 160-hour unpaid professional practice experience in the health information management department of a hospital or other healthcare facility. The school works with each student to set up this professional experience at a convenient location. Full-time students can complete the degree in four semesters. Required courses include quality and legal aspects of health information management, leadership in health information technology, and alternate care health information management. Graduates of the program qualify to sit for the national exam to become an RHIT. Alfred State’s graduates traditionally pass the exam at a rate higher than the national average. Individual’s interested in continuing their education in health information technology can enter directly into Alfred State’s technology management BBA or interdisciplinary studies BTech programs. SUNY College of Technology at Alfred is regionally accredited by the Middle States Commission for Higher Education (MSCHE). The AAS in health information technology program is fully accredited from the Commission on Accreditation for Health Informatics and Information Management Education (CAHIIM). Northwest Iowa Community College ranks #9 on The 25 Best Online Associate in Health Information Technology Degree Programs! Northwest Iowa Community College, located in the city of Sheldon, offers more than 43 vocational and academic programs, and the school’s career placement office offers lifetime assistance to its graduates. Students seeking a health information technology associate degree online can enroll in NCC’s associate of applied science in health information technology program. Full-time students, who must begin the program in the fall, can complete the program in four semesters plus one summer term. Individuals who enroll part-time can begin the program before any term. NCC’s degree covers a variety of skills, including maintenance of healthcare records, collecting and analyzing healthcare data, and human resources in the health information technology field. Learners must complete courses in medical terminology, health records in acute care, and allied health statistics. Classes include a combination of lectures, group work, and labs. All coursework is available online, but students must complete an in-person internship. Graduates can take the national test that leads to the RHIT credential, and NCC graduates hold a pass rate of almost 100% on this exam. Besides working in hospitals and other healthcare settings, graduates can find employment at government agencies, research firms, insurance companies, and within the pharmaceutical industry. Northwest Iowa Community College is regionally accredited by the Higher Learning Commission (HLC). The AAS in health information technology program is fully accredited by the Commission on Accreditation for Health Informatics and Information Management Education (CAHIIM). Neosho County Community College ranks #10 on The 25 Best Online Associate in Health Information Technology Degree Programs! Neosho County Community College is a two-year community college with campuses in Ottawa and Chanute, Kansas. The school serves approximately 2,500 students a year from all over the U.S., and it is home to the largest nursing program in the state. Students are required to complete two in-person professional practice experiences to acquire hands-on training in a healthcare setting. Prospective students must submit either an official high school transcript or proof of a GED certificate with their program application. Neosho County offers both financial aid opportunities like VA education assistance programs and prior learning credits. Neosho County Community College is regionally accredited by the Higher Learning Commission (HLC). 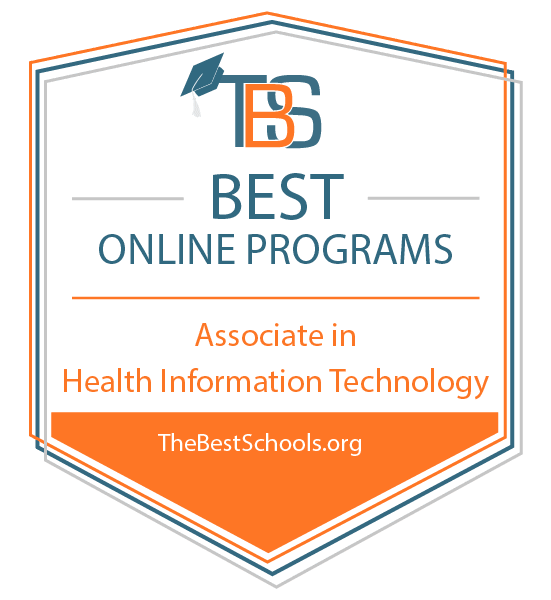 The AAS in health information technology program is accredited by the Commission on Accreditation for Health Informatics and Information Management Education (CAHIIM). Pitt Community College ranks among The 25 Best Online Associate in Health Information Technology Degree Programs! Started in 1961 as a state-run industrial education center, Pitt Community College is a two-year technical school in Winterville, North Carolina. The school offers a variety of health sciences degrees, and students looking for health information technology programs online might be interested in PCC’s health information technology AAS. This degree is available primarily as a distance education program, although learners must take two biology courses and complete an internship in person. Students learn to manage, analyze, process, compile, and report health-related information. Topics explored in the curriculum include patient information security, medical coding, cost control, and quality management. The program takes five full-time semesters to complete, and graduates qualify to sit for the RHIT certification exam. Applicants must submit official high school or college transcripts, take required PCC placement tests, complete two prerequisite courses in mathematics and biology, and have a confirmed clinical site placement (arranged by the program director). Students must also hold a minimum 2.5 GPA. In order to complete the professional practice experience, learners must submit to a criminal background check, drug screening, and a credit check, as well as demonstrate proof of U.S. citizenship. Pitt Community College is regionally accredited by the Southern Association of Colleges and Schools Commission on Colleges (SACSCOC). The AAS in health information technology program is fully accredited from the Commission on Accreditation for Health Informatics and Information Management Education (CAHIIM). Ozarks Technical Community College ranks among The 25 Best Online Associate in Health Information Technology Degree Programs! Students pursuing their health information technology degree online at Ozarks Technical Community College prepare to take AHIMA’s RHIT certification exam; OTC students consistently pass the exam at rates higher than the national average. Graduates of this Springfield, Missouri-based program go on to work in a variety of areas, including health information security and privacy, implementation of electronic health records, data quality management, compliance with payment regulations, and management of medical records. Typical places of employment include hospitals, nursing homes, medical offices, public health agencies, and insurance companies. OTC’s 69-credit associate of applied science in health information technology can be completed entirely online. Participants take required courses in health information technology applications, comparative health records and reimbursement systems, and medical coding. Specific topics explored in the program include health data maintenance, monitoring, analysis, and collection; health record privacy and security laws; and regulatory standards regarding health data reporting. Graduates of this program who earn their associate degree and certification can transfer to the University of Cincinnati to pursue a bachelor’s in health information management online. OTC encourages prospective health information technology majors to attend an allied health program informational session where they can obtain information related to program requirements, admissions, and acceptance rates. Ozarks Technical Community College is regionally accredited by the Higher Learning Commission (HLC). The AAS in health information technology program is fully accredited by the Commission on Accreditation for Health Informatics and Information Management Education (CAHIIM). Minnesota State Community and Technical College ranks among The 25 Best Online Associate in Health Information Technology Degree Programs! Minnesota State Community and Technical College, based in the city of Fergus Falls, offers a health information technology online degree that prepares students to manage patient medical data in a variety of healthcare settings. M State’s AAS in health information technology/coding is noteworthy due to its emphasis on medical coding; most other health information technology associate degrees take a more general outlook. The 64-credit curriculum focuses on a combination of information technology and healthcare. Covered topics include data interpretation, electronic health record management, development of clinical information systems, and patient health information security. The program is available fully online, with no in-person requirements, and distance learners benefit from support services like tutoring and library resources. Required courses include medicolegal aspects, human anatomy and physiology, and introduction to diagnosis coding. Students also take several professional practice credits. Distance learners in this program must pass a state and federal criminal background check to enroll in the required professional practice internships. Graduates of the program qualify to take AHIMA’s RHIT certification exam. Additionally, M State holds agreements with Charter Oak State College and the College of St. Scholastica, allowing graduates of this program to transfer and pursue a bachelor’s degree in health information management. Minnesota State Community and Technical College is regionally accredited by the Higher Learning Commission (HLC). The AAS in health information technology/coding program is fully accredited by the Commission on Accreditation for Health Informatics and Information Management Education (CAHIIM). State Fair Community College ranks among The 25 Best Online Associate in Health Information Technology Degree Programs! State Fair Community College, in Sedalia, Missouri, is a two-year institution established in 1966. SFCC hosts several extension campuses, including locations in Clinton, Boonville, and Lake of the Ozarks. Distance students can pursue SFCC’s associate of applied science in health information technology entirely online. This 63.5-credit degree emphasizes confidentiality, security, and integrity, teaching students how to effectively manage patient records in healthcare settings. Students pursuing SFCC’s health information technology degree online take classes in multiple disciplines, including management, information technology, medicine, and law. Coursework covers medical terminology, human disease and conditions, and coding. All students also complete a three-credit professional practice experience, which provides practical training and networking opportunities. SFCC also offers a 33.5-credit professional certificate in medical coding, which can be applied towards the AAS in health information technology requirements or used as a stand-alone certificate. Degree holders qualify to take the RHIT exam, and SFCC’s graduates pass the test at a higher rate than the national average. State Fair Community College is regionally accredited by the Higher Learning Commission (HLC). The AAS in health information technology program is fully accredited by the Commission on Accreditation for Health Informatics and Information Management Education (CAHIIM). North Dakota State College of Science ranks among The 25 Best Online Associate in Health Information Technology Degree Programs! North Dakota State College of Science is a two-year public institution located in the city of Wahpeton. The school offers degrees and certificates in more than 80 academic and technical programs. Among these is NDSCS’s online health information technology degree, which combines healthcare and technology. Students learn how to manage patient health information, code diagnoses and procedures, and administer computer information systems. Admission requirements include a high school diploma or the equivalent and sufficient ACT or ACCUPLACER test scores. NDSCS recommends that prospective students prepare for the program by taking introductory courses in medical terminology, anatomy, and computer applications. The 69-credit health information technician associate in applied science degree features required coursework in procedure coding; health, law, privacy, and ethics; computer applications in healthcare; and pathopharmacology. All coursework is available online. Learners also complete two professional practice internships, which combine in-person and virtual experiences. Internship hosts may require students to pass criminal background checks and drug testing. NDSCS recommends that students who plan to transfer to a bachelor’s program also take two additional biology courses. Distance learners can take AHIMA’s certification exam to become an RHIT during their last semester. North Dakota State College of Science is regionally accredited by the Higher Learning Commission (HLC). The health information technician AAS program is fully accredited by the Commission on Accreditation for Health Informatics and Information Management Education (CAHIIM). Davenport University ranks among The 25 Best Online Associate in Health Information Technology Degree Programs! The health information technology online degree from Davenport University, based in Grand Rapids, Michigan, teaches students to manage and analyze patient health data using advanced electronic health record systems. Topics explored in the curriculum include medical record management, coding for reimbursement, and health information regulations. The 69-credit associate of applied science in health information technology requires students to take courses related to quality and performance improvement in healthcare, applied statistics for health information management, and health information technology. Distance learners also complete two four-credit professional practice experiences: one in coding and one in health information technology. These experiences include lectures, lab work, and a clinical component, typically taking 40–80 hours to complete. Students must also agree to undergo a criminal background check and drug testing before enrolling in professional practice courses. Graduates can find work throughout the healthcare field, including at hospitals, insurance companies, and consulting firms. After earning their AAS, students can take the RHIT exam administered by AHIMA. Distance learners can opt to transfer to the health information management bachelor of science program at Davenport. Davenport University is regionally accredited by the Higher Learning Commission (HLC). The AAS in health information technology program is fully accredited by the Commission on Accreditation for Health Informatics and Information Management Education (CAHIIM). Sinclair Community College ranks among The 25 Best Online Associate in Health Information Technology Degree Programs! Distance learners searching for health information technology programs online should consider enrolling in the AAS in health information management program at Sinclair Community College. Students can complete this Dayton, Ohio-based program in five full-time semesters. To qualify for admission into the program, applicants must hold a minimum 2.0 GPA and complete required prerequisite courses. Sinclair’s associate degree in health information management focuses on management and the protection of patient health information, computer information system administration, and coding healthcare diagnoses and procedures. Courses available to distance students include specialized computer applications for health information management, introductory medical office coding, healthcare data in reimbursement, and ambulatory coding. The curriculum also features a professional practice internship. Participants who live in the 14-county area around Sinclair receive professional practice assignments to local healthcare facilities, while students who live further away arrange their own professional practice experience. A health information management capstone course at the end of the program gives students the opportunity to practice job interviews, prepare resumes, and take mock exams. Graduates qualify to sit for the national certification test required to become an RHIT. Sinclair Community College is regionally accredited by the Higher Learning Commission (HLC). The AAS in health information management program is fully accredited by the Commission on Accreditation for Health Informatics and Information Management Education (CAHIIM). Moraine Park Technical College ranks among The 25 Best Online Associate in Health Information Technology Degree Programs! Moraine Park Technical College, located in Fond du Lac, Wisconsin, offers degree and certificate programs in more than 100 different fields. The school has also offered distance education courses since the 1990s. Today, MPTC hosts more than 15 programs that can be completed entirely or almost entirely online, including an associate of applied science in health information technology. This 62-credit degree takes four semesters to complete, and graduates of the program qualify to take the national test needed to become an RHIT. The health information technology online degree at MPTC helps students learn to collect, analyze, and report healthcare data. Topics explored in the curriculum include professional behavior and ethics, coding, reimbursement systems, data management techniques, and data governance principles. Distance learners take courses in healthcare statistics, human diseases for the health professional, and general anatomy and physiology. Learners also complete a professional practice experience and a capstone course at the end of the program. Applicants must submit all transcripts and take a college placement test (either ACCUPLACER or ACT). Students also need to meet certain health requirements and pass a criminal background check. Additionally, MPTC recommends that prospective participants engage in a job shadowing experience before applying to this program. Moraine Park Technical College is regionally accredited by the Higher Learning Commission (HLC). The AAS in health information technology program is fully accredited by the Commission on Accreditation for Health Informatics and Information Management Education (CAHIIM). Rowan College at Burlington County ranks among The 25 Best Online Associate in Health Information Technology Degree Programs! Distance learners looking for health information technology online degree programs can pursue an associate of applied science in health information technology at Rowan College at Burlington County. Based in Mount Laurel, New Jersey, RCBC is one of the fastest growing community colleges in the U.S. The school’s AAS in health information technology is delivered primarily online, with some courses offered in person or through a hybrid format. Students take classes in a sequential order and many courses have prerequisites. Classes available to distance learners include legal aspects of health information, health information in non-acute care, and introduction to statistics. Participants also complete two professional practice experiences. The 68-credit degree takes five semesters to complete, and graduates of RCBC qualify to take the RHIT exam; RCBC students pass the test at a rate above the national average. Applicants must hold a high school diploma or GED certificate; successfully pass a high school-level biology course; hold a minimum 2.5 GPA; and pass any required developmental courses. Health information technology majors also submit to a criminal background check and successfully complete the Health Education System Incorporated Admissions Assessment test. Rowan College at Burlington County is regionally accredited by the Middle States Commission on Higher Education (MSCHE). The AAS in health information technology program is fully accredited by the Commission on Accreditation for Health Informatics and Information Management Education (CAHIIM). Hazard Community and Technical College ranks among The 25 Best Online Associate in Health Information Technology Degree Programs! Hazard Community and Technical College, located in eastern Kentucky, hosts two programs that allow distance learners to pursue a health information technology degree online: an AAS in health information technology and an AAS in medical information technology. Full-time students can complete either program in two years. HCTC’s health information technology degree features coursework in managing health data, determining health information budgets, and industry best practices. Students must complete 60–64 credits to graduate. The program includes coursework in general education and the supporting sciences, delivered through a combination of lectures, labs, and professional experiences carried out in local healthcare environments. Graduates qualify to take AHIMA’s RHIT examination. Health information technology majors also have the option to earn HCTC’s medical records coding specialist certificate. The medical information technology degree combines technical and interpersonal skills, graduating individuals who can work in the medical field and carry out coding, billing, and transcription. The program covers issues like medical insurance and coding, maintenance of medical records and reports, and accounting procedures. Coursework includes a professional learning experience that provides students with hands-on training. Hazard Community and Technical College is regionally accredited by the Southern Association of Colleges and Schools Commission on Colleges (SACSCOC). The AAS in health information technology program is fully accredited by the Commission on Accreditation for Health Informatics and Information Management Education (CAHIIM). Central Piedmont Community College ranks among The 25 Best Online Associate in Health Information Technology Degree Programs! Central Piedmont Community College, in Charlotte, North Carolina, offers a health information technology associate degree that combines information technology, business, and science. The program coursework is available entirely online, teaching students to analyze, compile, manage, and report health information in a variety of medical settings. Similar to other top health information technology online degree programs, CPCC graduates qualify to sit for the national certification test to become an RHIT. Part-time students can graduate in 8–9 semesters (including summer sessions), while full-time students can earn their associate degree in two years. Courses offered include health data systems, database utilization, reimbursement methodology, and principles of disease. The program also features three required professional practice internships; students typically fulfill these at healthcare facilities in and around Charlotte. Internships include a total of 192 contact hours and take place during business hours. CPCC encourages prospective students to attend a health information technology program virtual information session. This a limited enrollment program, with a maximum of 24 full-time and 12 part-time students selected each year. Applicants must submit official transcripts, take CPCC’s Test of Essential Academic Skills, pass a keyboard test, and hold provider-level CPR certification from the American Heart Association. Central Piedmont Community College is regionally accredited by the Southern Association of Colleges and Schools Commission on Colleges (SACSCOC). The associate degree in health information technology program is fully accredited by the Commission on Accreditation for Health Informatics and Information Management Education (CAHIIM). Tyler Junior College ranks among The 25 Best Online Associate in Health Information Technology Degree Programs! Tyler Junior College, a two-year school in eastern Texas, is one of the biggest community colleges in the state. TJC offers a variety of distance education programs, including an associate of applied science in health information technology. This 60-credit program includes 43 major-related credits and 17 in general education. Before entering the program, students must take a four-credit business computer applications course. TJC’s AAS provides hands-on training with information management technology applications, preparing students to work at a variety of healthcare organizations, including hospitals, behavioral health facilities, and physician offices. The curriculum covers healthcare privacy and security, health data analysis, coding and reimbursement, and information governance. Required classes delve into medical coding, health information organization and supervision, and coding and reimbursement methodologies. All coursework for this AAS is available online, and the school works with healthcare facilities near the homes of distance learners to help individuals find positions for a required clinical internship. Students must take program classes in the appropriate sequence, and graduates qualify to take the national certification exam to become an RHIT. TJC is the only college in east Texas to offer a health information technology online degree. Tyler Junior College is regionally accredited by the Southern Association of Colleges and Schools Commission on Colleges (SACSCOC). The AAS in health information technology program is fully accredited from the Commission on Accreditation for Health Informatics and Information Management Education (CAHIIM). Eastern Iowa Community College District ranks among The 25 Best Online Associate in Health Information Technology Degree Programs! Eastern Iowa Community Colleges boasts three campuses in the eastern part of the state, located in Clinton, Scott, and Muscatine. EICC serves more than 7,000 students in its associate and career technology programs, some of which can be completed online. The health information technology online degree at EICC requires students to complete 64 credits, including courses in medical terminology, ICD-10 procedural coding, allied health statistics, and clinical documentation improvement. Students also need to carry out two health information technology professional experience practicums, which provide valuable hands-on training and the opportunity to network. Prior to enrolling in these practica, students must submit evidence of good health by completing an immunization form and undergoing a physical exam. Learners also must hold medical insurance. The program helps students acquire skills related to health data management, research, quality monitoring, and reimbursement. Participants learn about all aspects of health data and its importance to medical agencies. The associate in applied science in health information technology program takes five terms of full-time study to complete. Graduates qualify to sit for AHIMA’s certification exam to become RHITs. Alumni of this program can find work across the healthcare industry, in hospitals, nursing homes, outpatient clinics, mental health facilities, and hospices. Eastern Iowa Community Colleges are regionally accredited by the Higher Learning Commission (HLC). The AAS in health information technology program is fully accredited by the Commission on Accreditation for Health Informatics and Information Management Education (CAHIIM). Metropolitan Community College ranks among The 25 Best Online Associate in Health Information Technology Degree Programs! Metropolitan Community College, based in Omaha, Nebraska, is one of the fastest growing institutions of higher education in the state. Students looking for health information programs online may be interested in MCC’s health data and information management AAS. All coursework is available online, but students must complete an in-person practicum to gain hands-on experience in the field. Before starting the AAS track, students need to pass certain general education classes, including coursework in English and humanities and social sciences. The curriculum explores issues like legal and information security standards, health data management and analysis, and industry best practices. Required courses include health data and electronic records; health law, privacy, and ethics; and clinical coding. Students must complete 108.1–109 quarter credits to graduate, which consist of 27 general education credits, 60.5 program-specific credits, and 21–21.5 credits of introductory courses in medical terminology, disease processes, and human anatomy and physiology. Graduates can take the national certification test to become an RHIT. Health information management professionals can find work as data analysts, clinical coders, electronic health record specialists, and cancer registrars. Students who complete the AAS can also continue exploring the field of health information management at the bachelor’s level. Metropolitan Community College is regionally accredited by the Higher Learning Commission (HLC). The AAS in health data and information management program is fully accredited by the Commission on Accreditation for Health Informatics and Information Management Education (CAHIIM). Portland Community College ranks among The 25 Best Online Associate in Health Information Technology Degree Programs! Portland Community College’s health information technology online degree combines theory and practice from the fields of information and healthcare. Students at this Oregon-based institution receive training in best practices related to collection, analysis, and management of healthcare data. The AAS in health information management program, which dates back to the 1970s, is competitive; PCC typically receives 45–55 applications each year but only accepts about 35 individuals. Prerequisites include courses in English composition, medical terminology, introductory algebra, and basic computer skills, although students may be able to test out of the computer class. Applicants must submit two letters of recommendation, unofficial transcripts from previous schools, and answers to supplemental questions. This 92-quarter-credit degree takes two years (six terms) of full-time study to complete. The curriculum includes courses in health record content in acute care settings, data management and analysis, healthcare statistics, and health information technology teams and training. PCC’s entire AAS in health information management is available online, with the exception of a required 40-hour practicum that students complete at local healthcare facilities during their last term. Students already working in the field only need to complete a 20-hour practicum. Graduates can sit for the national exam to become an RHIT. Portland Community College is regionally accredited by the Northwest Commission on Colleges and Universities (NWCCU). PCC’s associate in health information management program is fully accredited by the Commission on Accreditation for Health Informatics and Information Management Education (CAHIIM). Earning a health information technology associate degree online typically requires the completion of 60–70 credits. Students can pursue their degree on a full- or part-time basis to accommodate their schedules, and students who enroll full time earn their degrees in about two years. Throughout the program, students develop organizational and written communication skills that augment technical training in coding and computer systems navigation. In addition to coding processes, students learn electronic health records applications and the lawful handling of patient information. A health information technology degree online program includes both general education classes and major coursework. Students gain foundational knowledge in psychology, college-level math, human anatomy, and medical terminology. An overview of health information familiarizes students with professional ethics and popular methods of medical record organization and storage. Coding and data analysis courses equip students with knowledge of the International Classification of Diseases (ICD) coding system and current procedural terminology used by physicians. Students often complete an internship in a healthcare setting, allowing them to participate in billing and reimbursement processes and patient data management. Upon graduation, students qualify for entry-level positions in healthcare settings, including hospitals, physicians offices, and mental health facilities. The following provides a sample of the health information technology associate degree coursework. Although program content differs between schools, curriculum requirements often include similar core courses to prepare students for careers in areas like healthcare administration, informatics, and medical coding. Health insurance and reimbursement: In this course, students explore payment collections and patient reimbursements. Students examine the U.S. healthcare system and the implications of managed care. With this knowledge, graduates of the health information technology associate degree online program can pursue administrative careers in healthcare and insurance settings. Healthcare informatics: Integrating theoretical knowledge and practical applications, this course explores how information technologies impact healthcare delivery. Students gain an understanding of the evolution of medical record keeping and acquire skills in the implementation of software used to collect and store patient data. Graduates may qualify for employment as health information technicians. ICD coding: This course introduces students to the most commonly used coding system and diagnostic tool in healthcare today. Students become familiarized with ICD coding definitions, procedures, and anatomical codes. Medical billing, electronic record keeping, and medical transcription careers all require this course prior to employment. The following occupations provide an example of career opportunities available to those with a health information technology online degree. These professionals often work in hospitals and private medical practices. Regardless of the setting, graduates who earn a health information technology degree online operate with integrity, while demonstrating strong technical and analytical skills. Medical Records and Health Information Technicians: Roughly one-third of medical records and health information technicians work in hospitals. Other employers include physicians offices, nursing care facilities, and scientific laboratories. Skilled in the operation of patient databases, these professionals assess patient files for accuracy, record medical information, and use coding software to document procedures and operations. Medical Assistants: The majority of medical assistants work in physicians' offices where they complete a combination of clinical and administrative duties. A health information technology associate degree online program furnishes students with the training needed to carry out the responsibilities of medical assistants, navigating medical records, gathering patient data, and assisting with patient examinations. Medical Transcriptionists: Working primarily in hospitals and administrative support agencies, medical transcriptionists write reports that correspond with the dictation of doctors and other healthcare professionals. Earning a health information technology degree online familiarizes students with medical terminology and acronyms used in spoken communication, allowing them to accurately transcribe verbal recordings. According to a study conducted by the National Center for Education Statistics, adults ages 23–34 with a bachelor’s degree earned approximately $10,000 more each year than adults of the same age holding an associate degree. Students who earn a health information technology associate degree online receive the academic training needed to pursue a bachelor’s degree in a related area, such as those listed here. Upon completion of an associate degree, students only need approximately 60 more credits to fulfill the requirements of a bachelor’s degree. Health information management: This degree prepares students to become registered health information administrators, a respected credential available through the American Health Information Management Association (AHIMA). This degree emphasizes data collection to inform healthcare delivery and strategies for improvement. Healthcare administration: Preparing health information technology degree online graduates to advance from entry-level to management positions, this degree includes topics in risk management in healthcare settings, health policies and legal issues, and leadership strategies. Healthcare informatics: With topics in medical coding and health systems design, this degree allows students who have earned their health information technology online degree to acquire advanced skills necessary to oversee the operation of information systems in healthcare settings. Health information technology online degree programs offered by accredited universities feature standardized instructional methods supported by an inclusive school culture. Most colleges in the U.S. maintain regional accreditation. Earning a degree from a regionally accredited school allows students to apply for federal financial aid, transfer credits, and attend graduate school. A less popular U.S. higher education accreditor is national accreditation. Typically sought by trade and for-profit schools, national accreditation regulations require ongoing reviews and the enforcement of accountability measures similar to regional accreditors. However, credits and degrees earned from a nationally accredited school may not be recognized by regionally accredited schools. Other potential accreditors of an online health information technology degree include the Distance Education Accrediting Commission (DEAC) and the Commission on Accreditation for Health Informatics and Information Management Education (CAHIIM). DEAC ensures that online programs provide quality instructional experiences. Health information technology programs accredited by CAHIIM strive for quality improvement, academic innovation, and accurate assessment of student knowledge. A health information technology associate degree features accessible courses enhanced by faculty and peer support. As students move toward graduation, they may look for ways to continue this structured, supportive experience with others in their field through a professional organization. These groups can offer networking communities, career resources, and continuing education opportunities. Members often receive a subscription to informative newsletters in addition to discounts on training programs and events. American Health Information Management Association: Recently celebrating its 90th anniversary, AHIMA advances the quality of medical record keeping through its professional advocacy, online learning opportunities, and certification programs. Students benefit from AHIMA’s student and career center and networking events. Healthcare Information and Management Systems Society: This nonprofit international organization emphasizes the use of technology to improve healthcare delivery. HIMSS features a blog, IT healthcare news updates, and an online resource library. The HIMSS foundation awards scholarships to student members each year. Professional Association of Healthcare Coding Specialists: Developed to support medical coding professionals by providing educational and networking opportunities, PAHCS hosts a national healthcare coding conference annually and offers numerous coding specialist certifications in family practice, general surgery, and psychiatry.